The most peated Laphroaig. But not in a "prove a point" kind of way. Laphroaig distillery was founded in 1815 by Donald and Alexander Johnston and is located in Port Ellen on Islay. For a long while there’s been frenzy for Laphroaig’s Scotch. Rumor has it that Prince Charles of Wales himself is a big fan of the brand. But no matter what, Laphroaig is the Islay Single Malt by which all others are judged. They are the standard-bearers for the hearty, smoky style that Islay is famous for. Their core line up has no fewer than a dozen Single Malt drams plus a host of special releases and travel retail specialty editions. The folks at Laphroaig call Lore “The Richest of the Rich.” And it's easy to see why. This is a classic Islay-styled Single Malt Whisky to be sure, but they go a little beyond the normal. The name Lore comes from the very old-school production methods. The peat is hand cut. The malt is hand turned and cold-smoked. All if this harkens back to how they did it decades ago. The results are impressive. 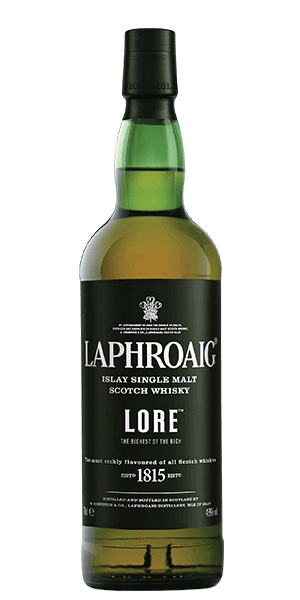 If you like your Whisky smoky, you will find Laphroaig Lore to be their most heavily peated dram. It won Double Gold medal at San Francisco World Spirit Competition 2017. Want to own a piece of an historic Islay distillery? Register to be a “Friend of Laphroaig” and you can obtain a lifetime lease of 1 square foot of the distillery grounds for the “rent” of 1 purchased dram of Whisky per annum … payable at the distillery pub. What does Laphroaig Lore taste like? The Flavor Spiral™ shows the most common flavors that you'll taste in Laphroaig Lore and gives you a chance to have a taste of it before actually tasting it. I like the Lore. This is my first lephroaig so I can't compare with other batches. Peaty . Way too peaty. Clearly, Laphroaig has learned from some recent mistakes and is going back to the flavor powerhouse profile that sets them apart. Over this, I'd still take a Lagavulin 16 or an Ardbeg Corryvrecken. However, this stands above the standard 10-year Laphroaig, which many of the offerings in recent years could not say. For the price, I label this an occasional buy. Something I'll keep on hand for special occasions. Like Saturdays. Easily scored in the 90s. Amazing! Smooth and easy to drink, almost too easy. Love the peat and oak to the nose. One of my new favorites! All the smokiness taken to a new height of deliciousness with caramel, vanilla, brine. Delicious! Such a rich and savory smoky peaty flavor with a decadently long finish. Maybe the best Whisky I have ever had. It bought a tear to my eye on my first tasting. Peaty but with a Smokey undertone which really balances out the peat. Harsh. I don't see how this is an international award winner. It's not characteristically Laphroaig IMHO. Very good; my house scotch is the Laphroiag 10 yr, and the Lore was well worth the incremental cost. Toby, the whining single malt scotch drinker, is kind of a douche. I also enjoy single malts, and it seems like you have a very good variety. I look forward to the rare finds. This Laphroaig Lore is wonderful.. I'm a single malt Scotch drinker, I didn't sign up as a Whiskey drinker. If you can't send me Single Malt Scotches, then cancel my membership today. If you love peat, this is exceptionally smoky and yet nicely balanced. A must for peat aficionados. Love love love the peat. I was not expecting too much from this bottle. I was admittedly biased against another NAS offering at such a high price. I am glad that I bit the bullet and purchased it! It is wonderfully smiley and has the usual Laphroaig notes but is bolstered by the youthful blend in the mix. I wish it was offered at half the price. Try before you buy if you're on a budget. Everything about a Laphroaig that people object to in one bottle. For the true Laphroaig fan. Very peaty, great if you enjoy a leathery taste. Very very smokey. If that's your taste, don't miss this bottle. Keep it in your mouth for a while to feel the extra smoke - if you drink it too fast tastes just like a regular Laphroaig. A must have for peated whisky lovers.